Semyon Nikolaevich Korsakov (Russian: Семён Николаевич Корсаков) was born on 14 January, 1787, in Kherson, modern Ukraine (then part of the Russian empire) in the noble family of the famous Russian military engineer Nikolai Ivanovich Korsakov (1749—1788) and Anna Semyonovna Korsakova (nee Mordvinova) (1765—1849). The founder of Russian Korsakovs family was Ventseslav Zigmund Korsak (1370-1435), a Lithuanian noble from Check (or Volga-Bulgarian, according other sources) origin, who in 1390 settled in Moscow. 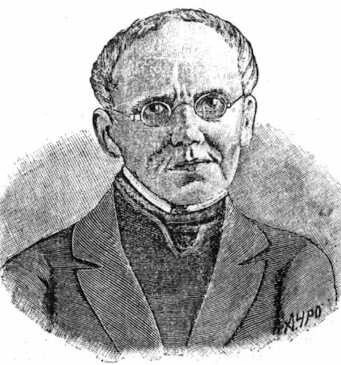 During the next centuries Korsakovs, and related families like Rimsky-Korsakovs (the famous Russian composer Nikolai Rimsky-Korsakov is from that family), Dondukov-Korsakov, Miloslavski (Ventseslav had a brother Miloslav), etc., established as some of the most reputable Russian families. In his youth, Nikolai Korsakov lived rather a long time in England, graduating at the University of Oxford with honors, and then working several years in Glasgow, Scotland. After his returning in Russia in late 1770s, he became an aide-de-camp and favorite of the Russian Prince Grigory Potemkin, and married in 1786 to Anna Mordvinova, a godchild of the Russian Empress Catherine II. The Engineer-colonel Nikolai Korsakov was an excellent engineer with promising future, but unfortunately, he died in his prime in accident during the famous Battle for Ochakov in August, 1788 (after the beginning of Russo-Turkish War of 1788-92 Korsakov put the uniform and entered the order of general Alexander Suvorov). Thus the only child of the family Semyon, who was only 1 during the incident, grew up under attention of his mother Anna and her brother, admiral Nikolai Semyonovich Mordvinov (1754-1845), a Russian naval commander and statesman (see the nearby image). After receiving a very good education, in 1805 Semyon Korsakov accepted a position in Russian Foreign Ministry. From 1812 until 1814, Semyon Korsakov took part in the Napoleonic Wars with the Russian Army, was wounded during the famous Battle of Berezina and received several orders (later in his life he was granted with prestigious Order of St. Anna and Order of St. Vladimir). 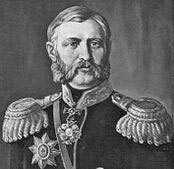 Later he served as an official in the statistics department of the Russian Police Ministry in St. Petersburg, then in Internal Ministry up to 1845, when he retired. Semyon Korsakov was married two times. From the first marriage he had a son. From the second marriage to his cousin (a daughter of his patron admiral Nikolai Mordvinov) Sofia Nikolaevna Mordvinova (1797—1877) he had 11 children, two of them died young, so left 3 daughters and 6 sons, one of whom, Mikhail Semyonovich (1826–1871) (see the nearby photo), became famous in his own right as governor-general of Eastern Siberia and was the namesake of the town of Korsakov in Sakhalin Oblast and several Russian geological features. 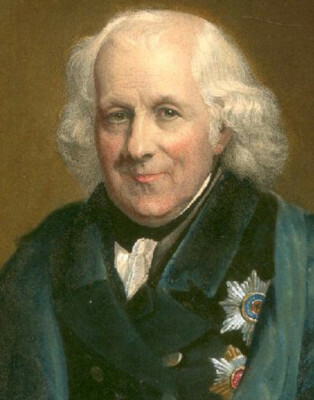 Though Korsakov was not formally trained as a doctor, he was very interested in medicine and he treated tens of thousand patients, at first using conventional medicine, but in 1829 switching to homeopathy. Later he was noted in homeopathic circles as the originator of a new method of dilution. Korsakov was a very competent mathematician, performed experiments with electricity, galvanoplastic, photography, etc. While working in the statistics department of the Police Ministry, Korsakov became intrigued with the possibility of using machinery to enhance natural intelligence and later he invented several devices which he called machines for the comparison of ideas, described in a 1832 brochure. Korsakov is known also for establishing in 1824 the first public information points (the Reference Place) in Russia, in St. Petersburg and Moscow. The key of very good water is in the courtyard of Tarusovo; there is a very beautiful stone church across Dubna... The village is close. The peasants are well-looking, and are seeming modest, but not drunkards. They live in the villages of Tarusovo and Garyah. The peasant buildings of the neighbors are good, and have enough livestock and horses and live well. I seem to be loved because I made various significant improvements to them. Korsakovs had a huge library with over 7000 books in the estate. They were a very hospitable family, and used to hold receptions, gathering many celebrities, between them: Ivan Andreyevich Krylov (Russia's best-known fabulists), Count Lev Nikolayevich Tolstoy, Alexander Ivanovich Turgenev (a Russian statesman and historian), and others. 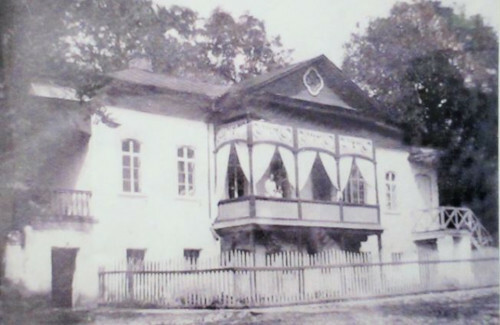 Later Korsakov's daughter, Natalia (1827—1915), opened in Tarusovo a school for peasant children, and she taught them literacy. In acknowledgment of Korsakov's service, the peasants plundered and set on fire their estate after the 1917 Russian revolution. 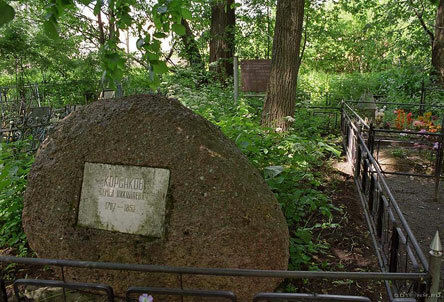 Semyon Korsakov died on 1 December, 1853, in his estate in the village of Tarusovo, and was buried there (see the image of his tombstone below).